Â¶ Matins: Zachary Wolfe believes (or, at least, hopes) that the future does not look good for a third Bloomberg term. But perhaps Mr Wolfe was writing before the ruckus broke out in Albany. Â¶ Prime: John Lanchester’s lengthy but extremely entertainingÂ Â essay on the banking bailout, “It’s Finished,”Â has been generating lots of buzz, at least at sites that I visit.Â Someone wrote somewhere that it ends “unhappily,” but I don’t agree. Â¶ Tierce: Toward the end of John Eligon’s account of Astor butler Christopher Ely’s testimony, my heart went into a clutch. The most horrific thing about this trial so far is the damage that it has been done to the reputation of attorney Henry Christensen. Â¶ Nones: Michael Sheen meets the Queen. The real one. Â¶ Vespers: At The Morning News, Man inÂ Boston Robert Birnbaum rounds up some good books about Cuba. Sadly, he omits Tomorrow They Will Kiss. Â¶ Compline: The Obamas and the Arts: a new model for the United States. Â¶ Matins: The nightmare of peak oil is back, at least according to an analysis of global production by Raymond James, reportedÂ at bothÂ WSJ Blogs and Infrastructurist. You haven’t forgotten what “peak oil” means, I trust. Â¶ Lauds: “A book about beauty naturally must deal with its opposite, kitsch.” Really! I thought that ugliness was the opposite of beauty, not some uneducated person’s idea of beauty. Robert Fulford writes about Roger Scruton’s new book, Beauty. Â¶ Prime: Michael Klein, who has certainly put in the hours at the track (and just around the livestock), waxes eloquent about Calvin Borel’s Derby win. Â¶ Tierce: Mirth in court â€” not shared by everyone. As more prosecution witnesses testified to the wit and charm of Brooke Astor â€” and noted that it faded in the early years of this decade â€” jurors couldn’t help noticing that her son, Anthony Marshall, wasn’t smiling. Michael Daly reports. Â¶ Sext: Does life really imitate art? Donald Trump will find out, if and when his plans for a golf resort ever materialize on theÂ North Sea coast of Scotland. Anyone remember Bill Forsythe’s Local Hero, with Burt Lancaster in the the Donald role? Â¶ Matins: Despite everything, Wall Street bonuses for 2008 totaled $18.4 billion â€” thank goodness! Â¶ Lauds: Ian McDiarmid’s adaptation of Andrew O’Hagen’s novel, Be Near Me, opens at the Donmar Warehouse to warm if cautious praise from Charles Spencer. Â¶ Tierce: Can anyone tell me the bottom line on the Blackwater story in today’s Times? The headline, “Iraq Wonâ€™t Grant Blackwater a License,” must mean that Blackwater will not be allowed to provide security services within Iraq, right? Not if you keep reading. Â¶ Sext: Here’s a project for Google Maps: mowing the lawn. Â¶ Nones: The best part of this story â€”Â ”Putinâ€™s Grasp of Energy Drives Russian Agenda“Â â€” comes at the end. Â¶ Vespers: Is Allen Bennett the new John Updike? He’s, er, two years younger. And quite as fluently prolific, if as a man of the theatre rather than as a novelist. Razia Iqbal talks about meeting him, but the interview is nowhere to be found. Â¶ Compline: We were neither of us in the mood â€” at all. But we had to go, in that grown-up way that has nothing to do with obligation. So we got dressed and went. And of course the evening was unforgettable: Steve Ross at the Oak Room. Holiday Note: Happy New Year! I’m not a scholar of English country houses, but, with the passage of time, even Buck House seems less peculiar than Blenheim. Blenheim is beyond the English-country-house thing. It’s a (mini) Versailles waiting to be appreciated as such. Only a Queen (Anne) would have tolerated its construction. 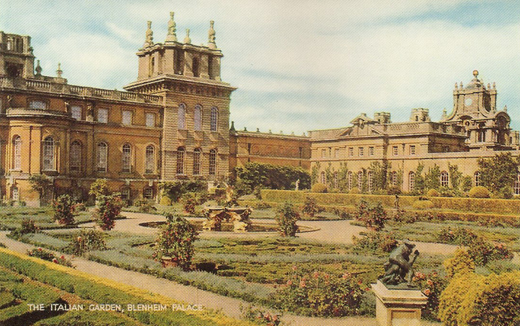 All the other Great Houses are the country seats of Whigs, but Blenheim, as the postcard says, is a “palace.” In that, it exceeds its original. For all of these reasons, Sabine PalliÃ¨res has no excuse. The gifts of fate come with a price. For those who have been favored by lifeâ€™s indulgence, rigorous respect in matters of beauty is a non-negotiable requirement. Language is a bountiful gift and its usage, an elaboration of community and society, is a sacred work. Language and usage evolve over time: elements change, are forgotten or reborn, and while there are instances where transgression can become the source of an even greater wealth, this does not alter the fact that to be entitled to the liberties of playfulness or enlightened misusage when using language, one must first and foremost have sworn oneâ€™s total allegiance. Societyâ€™s elect, those whom fate has spared from the servitude that is the lot of the poor, must, consequently, shoulder the double burden of worshipping and respecting the splendors of language. Finally, Sabine PalliÃ¨resâ€™s misuse of punctuation constitutes an instance of blasphemy that is all the more insidious when one considers that there are marvelous poets born in stinking caravans or high-rise slums who do have for beauty the sacred respect that it is so rightly owed. I must figure out how to make the heart of this paragraph serve as a credo for The Daily Blague.